* N70p 3L Gore-Tex® fabric with Gore® C-Knit™ backer technology. Zeta AR Jacket - Mens is rated 4.6 out of 5 by 7. Rated 5 out of 5 by Kelebek from GORE® C-KNIT™ BRILLIANT technology This C-Knit Jacket is nothing less than brilliant. NO "wet out" issues what so ever -NOT even after hours in heavy rain. I am atletic build. And usually i don´t fit into Arcteryx Trim Fit. But this Zeta AR is a little bigger. Leaves even space for a mid layer or fleece. Zeta is not bulky at all, and super silent. Smart engineered hood for us without helmet. C-Knit backer technology is very comfortable against the skin. Does not give you the normal cold sticky goretex feeling against the skin, -when it rains. Rated 5 out of 5 by Phlo from 6'3 (190cm) tall wearing Large - perfect fit I wear it nearly everyday since 3 months and highly recommend this jacket. So far the design and quality of materials are worth the price. The wind and rain protection is solid. - At around -3 C with strong winds I felt protected and warm on my bicycle or while hiking. I wore a T-shirt and a fleece (Delta AR) underneath the jacket. It breathes really well. - Cycling at warmer temperatures never made me feel like I'm overheating. Cleaning is very simple and revives the jacket all the time. Even tough stains! I had chain grease on my jacket from handling my bicycle. I got the grease off with mineral spirits and hand soap. After washing and drying the heavily treated spot on the jacket shows no trace of stains or discoloration and it is 100 % water-repellent. I haven't even used the DWR-Spray since my purchase in October. Rated 5 out of 5 by MarkieB from Great for British weather. Not for the first time I bought an Arc jacket thinking that I'd wear it for home and work use - only to find myself wearing it on top of wet and windy English fells or Scottish hills. Its very waterproof, of course, and it is completely windproof. The fact that it is not made of Pro shell is no bad thing in a cold and relentless south west wind. I like keeping just a little warm moist air about me in those conditions - its a bit cosier! Ideally the hood would be the storm hood that I have on other Arc jackets - but then I'm unlikely to tuck my hood into the collar. For anyone who will be doing this a lightly less enveloping hood will be an acceptable compromise. In late winter and early spring I've found it works very well worn over a T-shirt, making it an excellent all day jacket. And I have worn it to work a few times - it looks great with quite formal clothing. Rated 5 out of 5 by toomanybikes from The Best 3 Season shell out there Great cut you can wear with a t-shirt or fits over a moderate mid layer. I chose the AR over the LT for the pit zips and the torso adjustment. The zippers are so smooth. The c-knit mades the jacket light and comfortable. I'm 6' 2" 190 lbs and the size large is a great fit. Rated 4 out of 5 by KDogs from The sweet spot. I originally overlooked the Zeta AR as I was so preoccupied with buying something, in fact anything that had Gore-Tex Pro written on the sleeve. I originally bought an Alpha FL and thought it was the perfect jacket until I realised that my body shape would not accommodate a Trim fit jacket without pit zips. I hold a decent amount of muscle mass on my chest and lats which leads to the material being pulled up under my armpits causing extreme annoyance. Looking back the lack of pockets was also a problem which the Zeta addresses perfectly. Somewhere to store your gloves is useful to me. The majority of jackets with zip pits are athletic fit and were just a little too heavy duty for my intended use. As a bit of a wild card the assistant in UK Flagship store in London handed me a Zeta AR and immediately showed me how good the C-Knit felt to the touch. The Zeta is very quiet, soft and was much more comfortable than any of the other jackets that I tried on in store. It has a fairly long tail which comes down over your glutes, however it doesn’t feel restrictive in anyway. The cuffs are easy to adjust using the Velcro strips and the arm length suits the average. My only concern with this jacket is the design of the collar and hood. Being a one piece setup means that the collar sits well with the zip pulled right up, but if you undo the zip the collar does not lay well, you’re forced to unzip further than you want to in order to get the collar to lay flat. With the zip fully up and the hood pulled over your head it feels great and does a great job of being comfortable and functional at the same time. I had my concerns with the hood only utilising one draw cord to cinch it down, however it works really well and is less hassle that playing with many tags to obtain the right fit. I bought the Zeta AR to be used when I knew the weather would be wet, however it’s already turned into my go everywhere jacket, from walking the dog in an exposed countryside to strolling into the office in the City. Having order black it’s become a universal layer than matches well with almost anything. I'd rate this as 4.5 stars (but you can't), so it's 4 stars as the collar and hood design is a little annoying, not a deal breaker though. 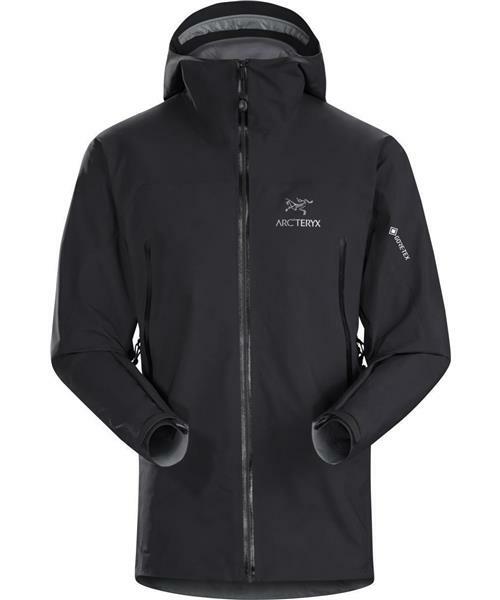 I don't know how many hours I spent reading reviews and travelling to try out the Arc'teryx range, but I do know that I'm happy with my choice and will use it extensively. Rated 5 out of 5 by KeithyD75 from Great all round jacket! Over the years I have owned a lot of Arc'teryx gear. I've owned a Beta AR and Alpha LT. I am now the proud owner of Zeta AR and I love it. Great fit and cut. Hood is amazing. Pockets are well positioned too. I'm 6" and around 185kg and a medium fits perfect. There's plenty room under for layering. I like the reflective logo on the jacket too. Rated 3 out of 5 by PaulM from Not lasted as expected I have been generally happy with this jacket as it looks good and is functional. It hasn't had hard use but I find now it's water repellency is poor compared to any other brands I have had over the years. I hadn't expected to have to be washing and retreating it so frequently. I should say this review applies to the previous version though I have had it less than a year.